Si tratta di un importante lavoro tassonomico sul genere di Curculionidae Molytinae Niphadonyx del prof. Massimo Meregalli dell’Università degli Studi di Torino. Il lavoro comprende la revisione del genere in base a diversi caratteri diagnostici che sono discussi rispetto ai generi più vicini. Esso comprende la descrizione di 43 nuove specie dell’Himalaya e della Cina Nord-Occidentale, con tavole fotografiche dell’habitus di ciascuna specie e dei principali caratteri morfologici. Tutte le località di raccolta delle specie sono georeferenziate e sono riportate su dettagliate mappe di distribuzione. Every year biologists describe about 17.000 new species all over the world. This means that in the future the work of the taxonomists will be long, very long. Considering that the total number of the species living on the planet has been estimated to be at least ten million species and that so far only little less than two million species have been catalogued, at the actual rate, the global inventory of biodiversity will end in 4-5 centuries. However, this time can be drastically reduced in consequence of the destruction of the rainforest, the richest source of biodiversity. In fact, naturalists estimate that the actual rate of destruction can determine the extinction of some ten thousand species every year. Therefore, taxonomy today is a very important discipline, but too early it has been neglected by Universities and Museums, that prefer to invest their scarce resources in other fields of the scientific research. But naturalists know how important is to study the biodiversity of an area. In particular, the study of the biological complexity of a tropical wild area can guarantee its preservation. Today, an effective policy of conservation of the rainforests and endangered ecosystems can’t leave out of consideration a serious scientific research able to list the species living in these environments, in particular the endemic ones. For this reason, the World Biodiversity Association, since the year of its foundation (2004), organized scientific expeditions in the hotspots of biodiversity all over the world, studied the materials collected and published the results of investigations in the following reviews: Memoirs on Biodiversity, WBA Monographs, WBA Handbooks and Biodiversity Journal. So I gladly welcome this editorial initiative suggested by the coordinator of our Scientific and Editorial Committee, Pier Mauro Giachino, related to the Asiatic fauna and, in particular, to the revision of the genus Niphadonyx. In this excellent taxonomic work of Prof. Massimo Meregalli of the University of Turin, the genus is re-defined, and differential diagnostic characters are discussed with respect to the most closely related genera, including some not yet named. Nomenclatural remarks and confirmation of formerly proposed genusrank synonymies are given. The work includes descriptions of 43 new species from the Himalayan Massif and North-West China. All collecting localities are georeferenced and detailed distribution maps are provided. Habitus photographs of all species and pictures of relevant morphological characters are also given. It’s really a wonderful work, a real example for clarity of exposition and quality of the scientific information provided. Only one remark is related to the delay in the publication of this book. 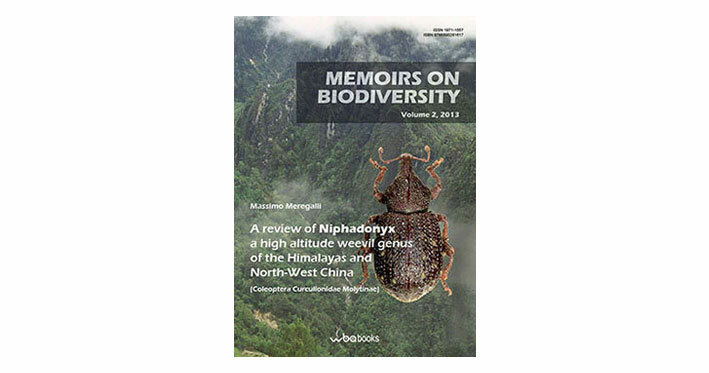 Almost five years have passed since the publication of the first volume of the “Memoirs on Biodiversity” in 2008, but our initial intention was to publish a volume every year. The problem is that in spite of the great number of requests from specialists (two more books with about 200 new species are waiting to be published) WBA is facing this particular negative economic trend with its structure of non-profit volunteer association; recently it has become impossible to maintain a regularity in publication of the scientific works produced by our members, and non-members. The main limiting factor is the lack of funds as WBA is an independent Association whose activities are supported solely by memberships fees and little contributions of members and friends. Therefore, particular thanks are due to the only private body which, since 2004, supported regularly our scientific and editorial activities: OPO Veneto (Organizzazione Produttori Ortofrutticoli del Veneto). Our goal for the future will be to maintain annual frequency of the “Memoirs on Biodiversity”. Finally a particular thank goes to our members Giulia and Dante Vailati for their valuable work of page make-up and images treatment, fundamental for a high-quality taxonomic work. Finding my first Niphadonyx was both immensely frustrating and a revelation. I had been crawling over a steep, misty, yak-infested mountainside for what seemed like hours with my friend and colleague Massimo Meregalli, following his instructions to turn over stones. The Niphadonyx were expected to be cowering in the earth and roots of the low alpine vegetation that this activity uncovered. They weren’t. Where was the first one found? Clinging to a rock in a cement culvert by the road that we’d walked over in an attempt to get to natural vegetation. Collecting weevils, especially high-altitude weevils, is a time-consuming and arduous task, necessitating not only hard physical work but also developing a keen understanding of the biology and behaviour of the insects. The results can be spectacular. In this case we realised that the insects were probably associated with a small plantain that was abundant in the rough freshly-disturbed ground near the road. Collecting several kilos of soil and rocks, sifting out the large chunks and examining the spread-out fine residue in the sun later on allowed us to collect the longest series of Niphadonyx ever found. A lot more work, a little more knowledge. More knowledge is what this paper is about. On the face of it, what follows is yet another revision of yet another genus of beetle. However, in reality it is the doorway to understanding more of mountain biodiversity, evolutionary patterns, and biogeography, and a tool to enable access to a hitherto unsuspected fauna. Like many small weevils, Niphadonyx has had a taxonomic career dogged by misleading names and unclear relationships, as well as a massive underestimate of the number of species in existence. In addressing these issues, and particularly in providing exceptionally informative photographs and maps, Dr Meregalli is turning an essentially unusable set of taxonomic names into a set of recognisable biological entities that can be both identified and used to understand more of mountain biodiversity. This essentially is the purpose of taxonomic revisions. Too often they are inward-focussed, providing just enough information for specialists to give a good guess as to what the species are. However, we are living today through in a biodiversity crisis, in which species and ecosystems are being lost without planning, thought or even knowledge of what is gone. International policies promulgated through the UN Convention on Biological Diversity have called for a reduction of the ‘taxonomic impediment’ – the lack of taxonomic expertise and information that prevents effective environmental management. A first step to addressing this problem is the provision of clear information of just what species are present in what places, and how they can be identified. Publications such as this one provide exactly that. A strong scientific foundation on which management decisions can be taken.